The River terminal located on the Illinois river will supply fertilizer at a high capacity exceeding industry standards. The new Yargus 6 Leg Tower will blend and wholesale at a combined capacity of up to 700 tph. 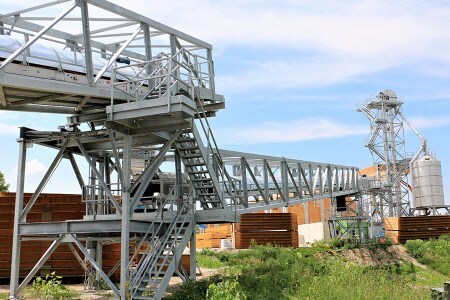 In addition the latest technology developed by the Yargus engineering team includes the "Yargus Stairway to Heaven" Access stairs system designed to allow operators to easily access all areas of the Yargus Tower and to improve worker safety by eliminating long lengths of access ladders in the system. Steve Shaffer, General Manager, Yargus Manufacturing, said: "At Yargus our engineering and R&D Team are working on many new developments, but one of the main focuses is to set new standards in operator safety. The Stairway to Heaven access stair system is an industry first in a high capacity tower system. Our innovation awarded Yargus a runner up award in the Farm Journal's yearly awards program. We are extremely proud of this design and the feedback from customers has been excellent as operators will now access critical inspection areas more frequently and safely." In this project the Yargus Tower system uses the 6.60 t Yargus Performance Mixer that uses a low intensity mixing system to uniformly blend and coat fertilizers . Other Yargus Towers have the option to use a Yargus Tapered Vertical Blending System in a 16 or 18 t model. To date the progress of the new Yargus River Terminal is proceeding well.